What role does reason play in our lives? What role should it play? And are claims to rationality liberating or oppressive? For the Sake of Argument addresses questions such as these to consider the relationship between thought and character. 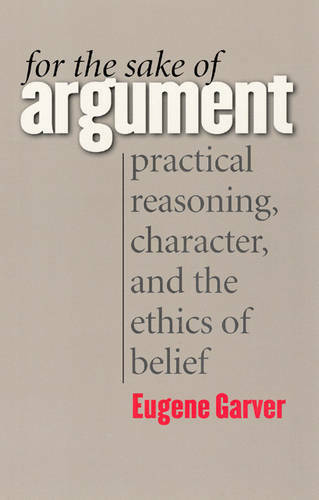 Eugene Garver brings Aristotle's Rhetoric to bear on practical reasoning to show how the value of such thinking emerges when members of communities deliberate together, persuade each other, and are persuaded by each other - that is to say, when they argue. Garver roots deliberation and persuasion in political friendship instead of a neutral, impersonal framework of justice. Through incisive readings of examples in modern legal and political history, from Brown v. Board of Education to the South African Truth and Reconciliation Commission, he demonstrates how acts of deliberation and persuasion foster friendship among individuals, leading to common action amid diversity. In an Aristotelian sense, there is a place for pathos and ethos in rational thought. Passion and character have as pivotal a role in practical reasoning as logic and language.